Timeline Battle Castles is the second in the Timeline series. The app was created by the producers of Dan Snow’s Battle Castles TV series. 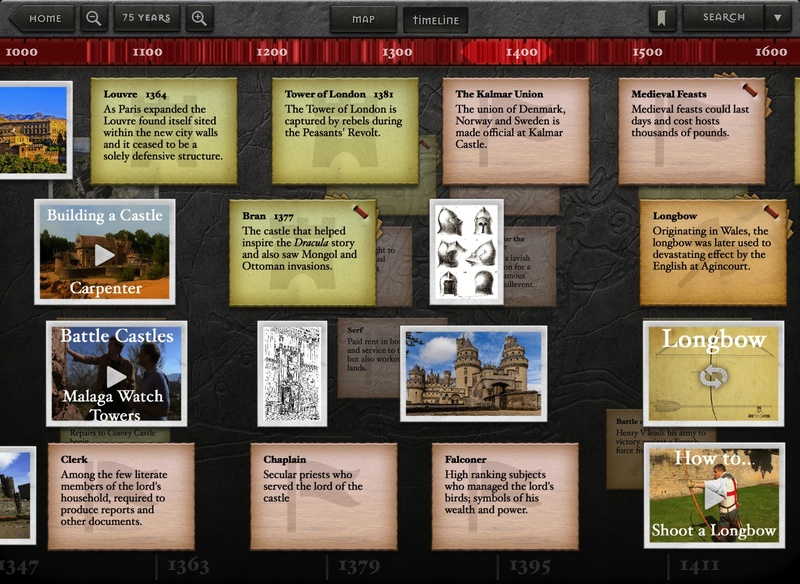 It provides a great way to learn more about various aspects of medieval times. This fantastic app offers multiple methods for use; peruse the timeline or map, search for something specific or navigate by topic. Watch videos, view photos and read facts to learn more about castles, sieges and life in medieval times. An amazing amount of content on a variety of subjects spanning over 500 years is included. The app covers more than just castles and battles. I really like that it includes topics covering the day-to-day life of the castle; such as a video on pen and paper making or the important role of blacksmiths and rope makers. Learn countless facts through various multimedia methods. Information is presented in such a way that the user is quickly immersed. Text is easy to read, presented in short clips so the user is not likely to become bored or overwhelmed. From the timeline, choose to view the information by century, decade or year. On the map, see castles and sieges pins on a map. Click on the desired pin to find out more. This app is entertaining without being game focused. It is similar to reading a good book or watching a fascinating documentary. This is a higher priced app compared to most that we feature on the site, but it’s really not that far off the mark when you consider the quality of the photos, videos and design, and the amount of content included. Great for the family or schools; this app would also be good to buy before traveling in that part of the world. For a child to use this app to its fullest potential, the child will need to be a proficient reader or to have someone available to read to them. A narration option for the text portions of the app would be beneficial to younger users. An internet connection is required for videos. All social media buttons and external links that could cause the user to exit the app are tucked away under the Find Out More menu. The app does not contain in-app purchases or ads.